7 fun facts about Evian Facial Water Spray + giveaway! Evian mineral water has been in my environment since birth. My mom used it to dilute my formula when I was a baby - true story, and it's fairly common for French parents to do so because Evian is a pure and safe mineral water constantly controlled for quality (and it's also cheaper in France!). I've also used the spray bottles from a very young age, and I always have one in bathroom. I use it after or instead of my toner, to refresh during a hot day (those are not uncommon in San Diego), or lightly to fix my makeup. I also like to take a travel size with me on hikes, bike rides, or even to my hot yoga classes. 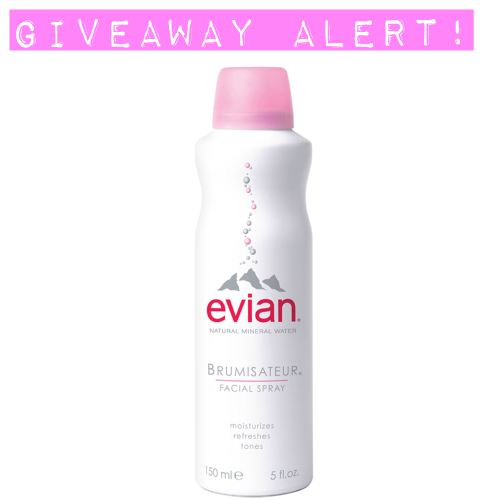 Evian Facial Water Spray has long been a staple in my bathroom and today, you can win a set of two 5oz spray bottles! - Evian water gets its name from the town where the main source is located, Evian-les-Bains. It happens to be near the Geneva lake, and in my native region Rhône-Alpes. - It takes about 15 years for a drop of water that falls as rain or snow on top of the French Alps to end up in the underground Evian catchment. During these 15 years, the water is slowly filtered by glacial rock and sand, where it gains its mineral content. - Thermal spring water from Evian-les-Bains started being sold around 1790 after the Count Jean-Charles de Laizier reported that it helped with his kidney and liver issues. - Evian Facial Water Spray was first introduced in France in 1962, as part of a treatment for burn patients. It was also the first facial water spray launched in the USA, in 1978. - Evian is the only facial spray sold in the USA that contains pure mineral water deemed suitable to drink, following (in fact exceeding) the drastic standards put in place by the French government for mineral drinking water. - The water is tested 300 times per day to ensure constant quality. - Nowadays Evian water is distributed in over 120 coutries. This giveaway is hosted by the Wilkes Group, distributor of Evian Facial Spray since 1978. The Wilkes Group is giving away a set of two 5oz Evian Facial Spray bottles to 20 lucky winners (note that this giveaway is also active on other blogs and social media, not all 20 winners will be readers of Beaumiroir!). - use the widget below. - leave a comment to tell me how you use your Evian Water Facial Spray, or how you intend to use it if you haven't tried it yet! (optional).